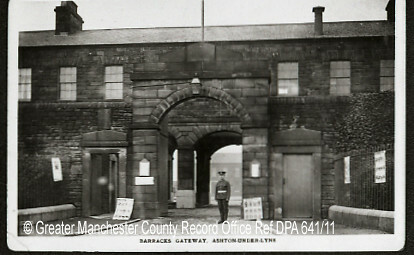 After the end of the war a number men from Royton compiled a record of their experiences as prisoners of war of the Germans. Among them was Michael Dowdall who was taken prisoner near Cambrai on Saturday 30 November 1917 after he had been in the front line for 48 days. The soldiers were about to have breakfast when the officer gave the order to ‘stand to.’ Having got no reply to their SOS they were soon outnumbered by the Germans, shells and machine guns all round them. The officer told them to down and surrender and they were then marched two miles to a hut where all letters and pay books were taken from them. They were then marched again for eight hours and put in a cage (for prisoners) for the night in the rain. Next day they marched a long journey and 600 of them were put in a former motor car place, with a red cross on it, for the night. It had a wet stone floor on which the men were tightly packed and had to be on top of each other to sleep. After three days the men were sent to a railway station and put 50 in a truck (suitable for eight horses) with no light and only a cup of watery soup every 24 hours. They were taken to a big camp in Munster in Germany. There the rations were one loaf of black bread for 12 men and two cups of soup each. They stayed at the camp for 14 days and were inoculated four times every second day. The prisoners left Germany on 16 January 1918 and were sent to Antoing in Belgium where a new railway was being made. Up at 5am, a drink of coffee at 6am, an hour’s march to the railway and starting work at 7.30am. Work was with a pick and spade and carrying lines and sleepers until 3.30pm, then a march back for soup, a piece of bread and coffee. After three months the prisoners were taken to Fasnes where they were accommodated in an old brewery, about 250 men to a room. Here coffee was at 5.30am, fall in at 6am, arrive for work at 7am in the yard to be detailed work on railways, unloading transport wagons, making new railways or unloading coal bags until 3.30 p.m. From 7pm to 5.30am the prisoners were locked in their rooms with a tub for all to use as a toilet. If a man reported sick his bread was stopped for that day and reporting sick two days together was not allowed. One day Michael was too ill to stand up but was sent to work unloading a barge. The barge people gave the German guard some soap (soap was like gold to the Germans) and he let Michael rest for a bit and the bargees gave him some bread and coffee. Michael was glad to be moved on to Blanc Misseron in France near Valenciennes. Here they looked after horses, working with them from 6am to 6pm. After a month there the prisoners started getting Red Cross parcels and enjoyed having more food to eat. They began to feel better and things were going well until our planes started dropping bombs over the town. On 1 June 1918 there was a big explosion at an ammunition depot where all our shells and bombs were sent and girls took the explosive out to use in German shells. A girl in number five mill dropped the bomb as she was working and it exploded and set off others. Many men, women and children were injured with limbs blown off and some were badly burned. The Germans got the wind up and ran away. The prisoners pulled the shutters down from the windows of houses to make stretchers and carry the wounded out of the way. Michael and the other prisoners were still looking after the horses but had to sleep in the fields for safety. On 13 October 1918 the Germans began to retire as the Allied soldiers were making them leave Cambrai and Valenciennes. The prisoners walked the horses from Blanc Misseron with five horses a man for over four weeks, arriving in Liege on 13 November 1918. Here they were well looked after in houses with a nice good bed and plenty of food. They left Liege for Brussels on 3 December 1918 to make their way back to England. Michael Dowdall was born in Salford in 1885, the son of Patrick and Mary Dowdall from Ireland. In 1891 the Dowdall family were living in Chadwick Buildings in Broughton, Salford. By 1901 the family had moved to 203 Middleton Road, Royton where Patrick was employed as a stationary engineer. Michael married Margaret Williams at St Aidan’s and Oswald’s church in Royton on 26 December 1908 and their son, Michael Patrick was born in 1909. In 1911 the family were living in a four-roomed house at 2 Beswick Street, Royton and Michael was employed as a cotton cloth maker-up in a dye works. Their second child, Mary Margaret was born on 26 October 1912; Michael, their son, died in 1914 aged 5. Michael Dowdall enlisted on 5 September 1916 at Ashton-under-Lyne barracks. He was 5ft. 7 ins. tall with a fair complexion, brown eyes, black hair and a scar on the bridge of his nose. He joined the 10 (Scottish) Battalion of the King’s Liverpool Regiment with service number 358659 and went to France on 3 January 1917.